The East Side Gallery in Berlin’s borough Friedrichshain is the longest, the largest and probably also the most impressive remaining part of the Berlin Wall that is still in it’s original location and more or less intact. Between the river Spree and Mühlenstrasse the East Side Gallery is an impressive monument that shows how massive The Berlin Wall once actually was. Seeing bits and piece of the Berlin Wall is one thing – and I highly recommend it before visiting the East Side Gallery. You can literally find pieces of the Wall all around the world. And single elements are or course also present all across Berlin City. Visiting the Berlin Wall Memorial (Gedenkstätte Berliner Mauer) on Bernauer Strasse for example would probably a good start. It adds another quality of understanding, what The Berlin Wall really meant to the city and the people. On Bernauer Strasse you can for example also see other parts of the massive East-German border installations like watch towers, fences, a second wall etc. But also the remaining Wall elements on Bernauer Strasse are only a very local presentation, lacking the feeling of having an ongoing (and ongoing) massive wall all across the city. This is probably what makes the East Side Gallery Berlin monument so unique and important: here you can at least get a feeling for the sheer massiveness of a continuous wall, splitting a city in two. You can walk down Mühlenstrasse for quite a while, and the Wall just would not end. And that is one of the many details of the separation of West- and East-Berlin that are pretty hard to communicate. The Berlin Wall was somehow ‘endless’ since it completely surrounded West-Berlin. If you continued walking along the Wall for hours and maybe days, you would end up right where you started. If that’s not depressing then what is? The actual attraction of the sight East Side Gallery is quite diverse: you could say “It’s a wall”. But as the name suggests, the wall / the site / the sight is of course also a gallery. In 1989, right after the fall of the Berlin Wall, hundreds of artists from all around the world came together at this site and covered the until then flawless East Side of the Berlin Wall with over 100 paintings – a freeze frame expressing the feelings, the hopes and the visions of that historical moment in time. It’s just sad, that the paintings are not protected from vandalism and further graffiti. Some people are leaving their mark, obviously not understanding that they are bit by bit destroying an important and beloved non-profit piece of art – and piece of history. You may have the impression, that the East Side Gallery is an official memorial sight – but as far as I know the artists’ initiative that takes care of it and its preservation actually still is neither ideologically or financially support by any government institution. I find this quite a scandal, if you consider that the East Side Gallery is such a unique monument. And of course it also attracts visitors to the city – it is said that over one million visitors a year are visiting this very original attraction. One other political / geographical detail of the East Side Gallery may also be a bit misleading for first time visitors: here on Mühlenstrasse the East Side of the Wall is covered with colorful art pieces. But before 1990 however only the West side of the wall was covered with ‘Wall Art’ – graffiti, drawings, a rather unorganized mix of everything and anything that could be applied to a wall. 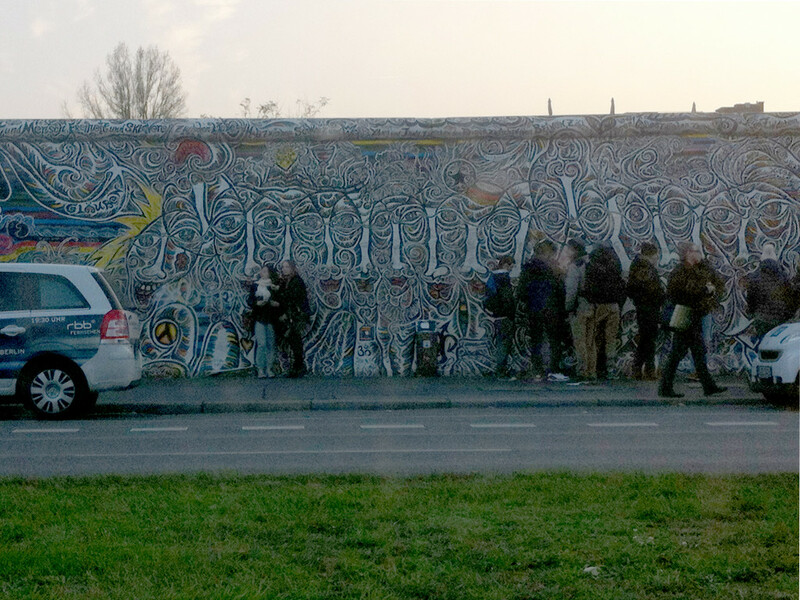 Although in this particular spot, where the East Side gallery is located, even that was impossible since here The Wall was on the east side of the river Spree – literally out of reach for any artist approaching it from the West Side. The East Side of the Berlin Wall however was a no-access area anyways – it was only one part of a complex border installation. But this is of course part of the concept and part of the beauty of East Side Gallery. So this particular spot never was covered with graffiti – and hopefully never will be. Please don’t leave your mark – it’s not cool – it’s just disrespectful. Think of this piece of the Berlin Wall as a piece of art. It’s a gallery – and damaging one of the art pieces only endangers the hole project. There are literally more than enough powerful people that would love to tear down this remaining part of the Berlin Wall. Preserving the Art is preserving the Wall is preserving History. The monument East Side Gallery stretches ‘only’ over 1300 meters along Mühlenstrasse between Oberbaumbrücke and Strasse der Pariser Kommune. If you want to ‘do the walk’ I would recommend you either take the S-Bahn or the U-Bahn to Warschauer Brücke. You could also of course take the U2 and get off at Schlesisches Tor. You would then have to walk across the bridge Oberbaumbrücke – which can be very nice: you have quite a nice view towards TV-Tower and you can also see the West Side of the East Side Gallery from the bridge. But whatever you decide for – be aware that there are no roofs nearby. The only accessible roof might be the the roofed sidewalk of Oberbaumbrücke. So you should probably first check the weather report, before you get to East Side Gallery – and/or bring an umbrella. On a sunny day however this can be a perfect spot to hang out for hours. You could first walk down Mühlenstrasse on the far side, so you could a a broader view on the Wall. On your way back you could then walk close to the Wall, enjoying all the details of this monument. In the summer you may find small cafés / bars between the Wall and the river Spree to hang out at. There is no ‘entry’ to the East Side Gallery monument – and there is no ticket counter – and there is no tickets sold, no admission fee. The East Side Gallery is a free standing installation – so it can be basically accessed freely. To sum it up: it’s free. The East Side Gallery Berlin is open all day and all night, every day. As already mentioned above there are no tickets sold. Access to Berlin East Side Gallery is free of charge. It’s just a wall after all – currently no additional walls or fences around it. You can either take the subway (U-Bahn) U1 or the Tram M10 or S-Bahn to Warschauer Strasse and walk 5 minutes down to Mühlenstrasse. Another option would be to take the U-Bahn U1 to Schlesisches Tor, walk over Oberbaumbrücke and enjoy the view first. Or you take the S-Bahn to Ostbahnhof and walk 5 minutes down to Mühlenstrasse. 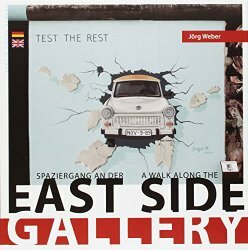 Over 200 photos and artist photos of East Side Gallery on 128 pages. 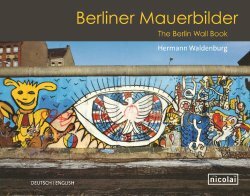 Berlin Wall Art, documented and photographed between 1984 and 1990 ‘on location’ by the artist and designer Hermann Waldenburg. Text in English and German.